But enough about me complaining, lets see what the next two mystery sticks had in store for me! A nice looking lancero with a Cubanesque construction. There’s are plenty of bumps and veins along the length of this cigar and it’s quite soft when squeezed. 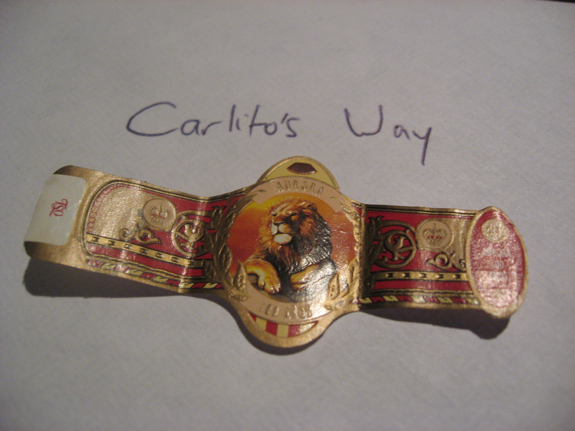 The wrapper gave off a nice aroma of cedar and the foot added a bit of fruity tartness to the mix. The cap clipped off cleanly with my double bladed guillotine cutter and a small single flame torch gave me a nice even toasting. The initial draws brought with it a good helping of cedar with a nice side-note of spice. Perhaps a raw nutmeg? The tartness is still around but it comes and goes between draws. The smoke is nice and full and so far the cigar is burning at a comfortably slow pace. The body starts off in the low medium range and the retrohale has a light spice bite with a cedar finish. As I smoke this I just read a previous blind review of the 107 lancero I sent someone and I can’t help but think this tastes very similar. I should know since I’ve smoked so many 107’s but I feel this has something different in the mix. Or maybe I’m just psyching myself out? The spice and cedar seem to be the primary flavors here going into the halfway point, they are balanced well and have a smooth finish. Pretty sure this is not a 107 anymore since I’m not getting any more of the tartness I’m used to from them. Perhaps a DPG Lancero? We’ll see if the spice kicks up a notch in the last half. Ash in moving along nicely, staying tight and clean before being tapped off into the ashtray after an inch or so. Heading into the last third the body has built up a bit and the spice is developing as well as some nice roasted coffee and nutty flavors. Heading for a nice finish with no burn problems at all. Bite on the retrohale picked up a bit too! Post-Reveal Notes: Totally confused me yet again! I’ve only had a couple 100 Anos and I forgot they had a nice spicy kick to them. 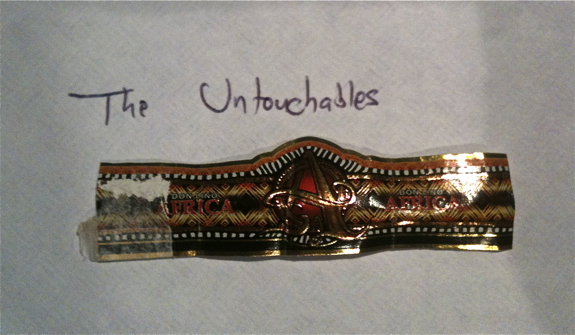 I guess I was on the right lines with the La Aurora brand and I threw that idea to the gutter too early! lol Yet another reason why I continue to enjoy La Aurora’s, even blind their sticks continue to impress me! This vitola was on my shopping list for sometime in the future and I’m glad I got to try it! 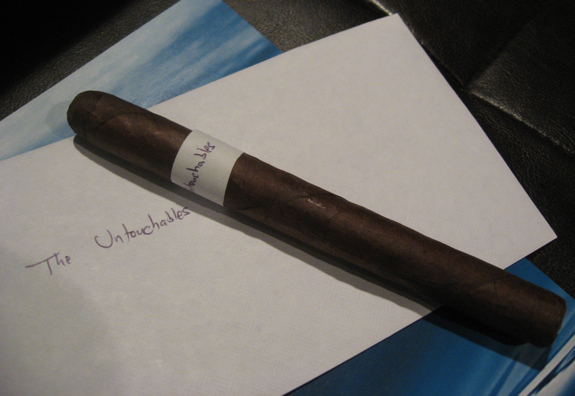 A nice dark wrapper surrounds this lancero vitola cigar with quite a few bumps and veins. It’s got a very soft feeling near the foot but gets a little more firm at the halfway mark. The cap clips cleanly off and the pre-light draw brings with it lots of cedar and a good helping of peppery spice. The cigar is starting off on the high side of mild bodied and burning even and slow. Just the way I like it! I started to get a bit of coffee flavors after about an inch which balanced out the profile even more and made it very tasty. A little bit of leather also mixing in with the existing flavors and so far very enjoyable through the first half. Ash is lasting about and inch and falling off into the ashtray by itself. The retrohale has a nice little bite and a smooth cedar finish. I’m getting a bit of a funky burn a little past the halfway mark that was quickly fixed with a touch up from my lighter. The flavors are starting to intensify into the last third, more roasted coffee and cedar with a little more spice into the mix, almost a spicy paprika type here. The flavors are definitely keeping me interested and on my toes. 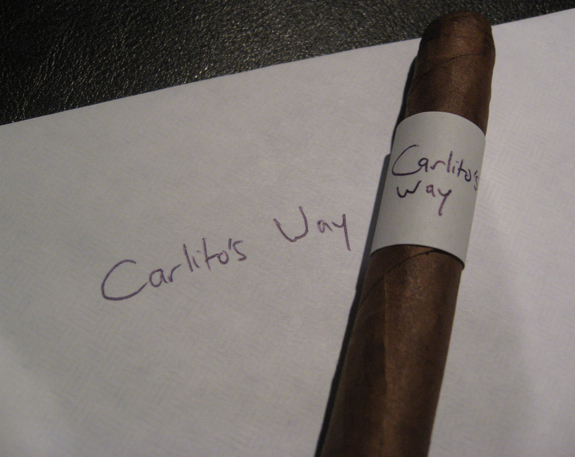 Post-Reveal Notes: This was a very interesting cigar and one that has actually never been on my radar. I’ve seen people post about it on various social media sites or blogs, but I never read much into it. This is the beauty of these blind reviews, they really open your eyes to brands you may have never even considered. Just to wrap up these reviews, it was yet another successful and fun blind tasting for me and I’m very glad I participated. I hope you enjoyed reading these and seems we get a lot of good feedback from these types of reviews so be assured you will see more in the future! Sorry for the double email to whoever got it! Link had an issue and I needed to repost! I blame Tony, just because I feel like blaming Tony. Everyone else join me in blaming Tony! I have to blame K. Hansotia and Rocky Patel for giving us the cigar equivalent of spam. Two lanceros – nice! I’ve been curious about the Don Lino and now I’ll really have to try it. Love these blind reviews. Welcome back!